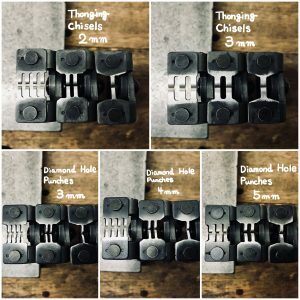 Pro Punch | Item list | The production and sales of leather crafting tools. Japanese leather tools. Oka Factory & Co.,Ltd. 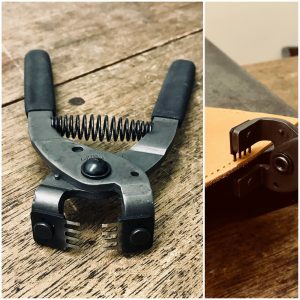 Plier Pinch-type function tool for leather stitching. There’s almost no sound made when hole punching so it’s fine to even work at night. The tool maker which had been making this tool closed their business so this tool disappeared from the market for a while. We revived this tool because of many requests from customers. We tried to reconsider the blade shape, the design so as to respond to the demand. ① Using tool steel, the whole blade is tempered. The blades correspond to our Diamond Hole Punches and Thonging chisels. 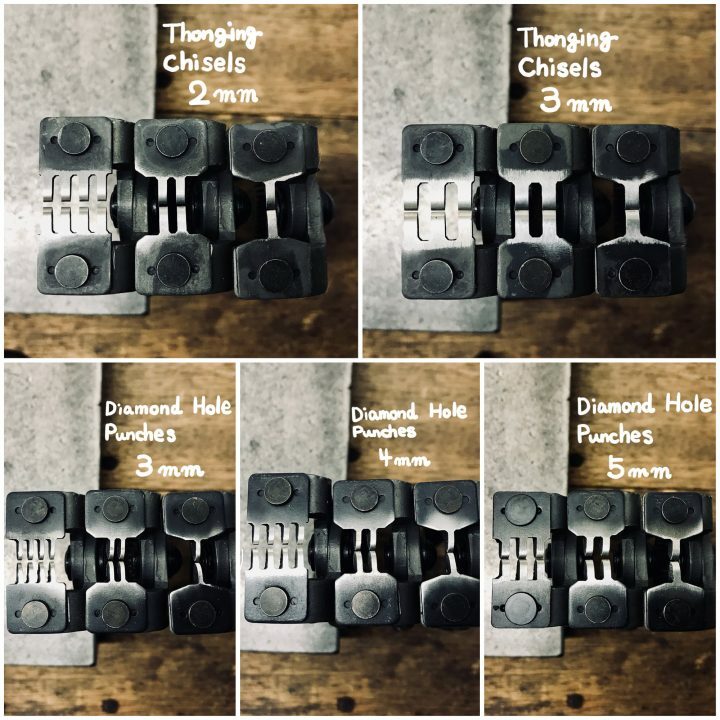 Please use either type of the two punching tools properly on a suitable location of the leather. The blades are classified by different colors. ② There is a 10mm space between the blades so as to enable you to use the tool even on thick materials. ③ For tool frame, gray coating prevents rust. ④ Urethane Rubber is used for the handle grips so as to enable working for a long time comfortably without hands becoming sticky, keeping leather materials clean. ⑤ Diamond shape blade-type has a white point mark on the upper side so as to be sure you make the same hole shape on the leather sheet. ＊This tool has a very delicate blade structure so refrain from exerting too much pressure when punching. When excess pressure is applied, it may cause the handle stopper to deform putting extreme pressure at the blade head. ＊ We created the tool based on the assumption it is used with leather of 2.0mm thickness leather or more. Leather under 2.0mm thickness is not suitable for this tool. 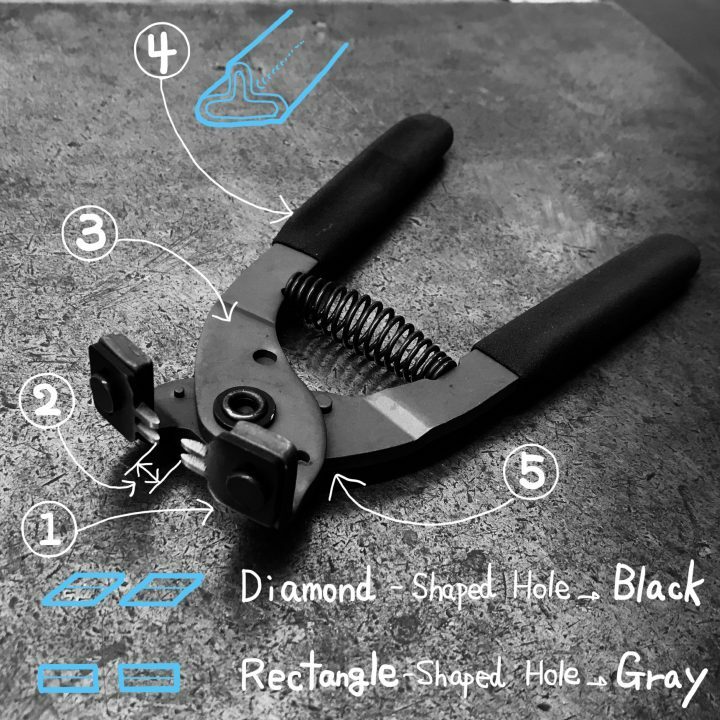 When you use thin material, please use our alternative “Diamond Hole Punches” or “Rectangle Hole Punches” tool. ＊The tool has a rust-proof coating except for the blade head and rivet which may be prone to rusting. Applying oil on those parts will prevent any rusting and keep the tool in good condition.